Using a screwdriver, pull out the solar sensor, then disconnect the connector. Using an ohmmeter, connect the positive lead to terminal 2 and the negative lead to terminal 1, then measure the resistance between the terminals. 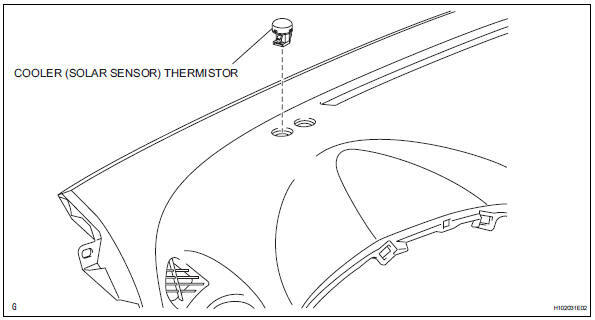 The connection procedure for using a digital tester such as a toyota electrical tester is shown above. When using an analog tester, connect the positive (+) lead to terminal 1 and the negative (-) lead to terminal 2 of the a/c solar sensor. As the inspection light is moved away from the sensor, the voltage increases. Use an incandescent lamp for inspection. Bring it within 30 cm (11.8 In.) Of the a/c solar sensor. If the result is not as specified, replace the solar sensor. Connect the connector, and then push in the solar sensor.